For those applications where being seen is of the utmost importance, MCR Safety's Luminator™ Series offers you a variety of high visibility garments made in different colors and different options of reflective material. The 2083SR 3 pc suit that is made with fluorescent lime PVC/Polyester/PVC material that is .38mm in thickness. It features two silver reflective stripes around the torso of the jacket, reflective stripes over each shoulder, and around each arm. It also features a snap front with storm fly and a detachable drawstring hood. The bib pants feature partial elastic suspenders with quick release snaps, a fly front, and reflective stripes around each leg. 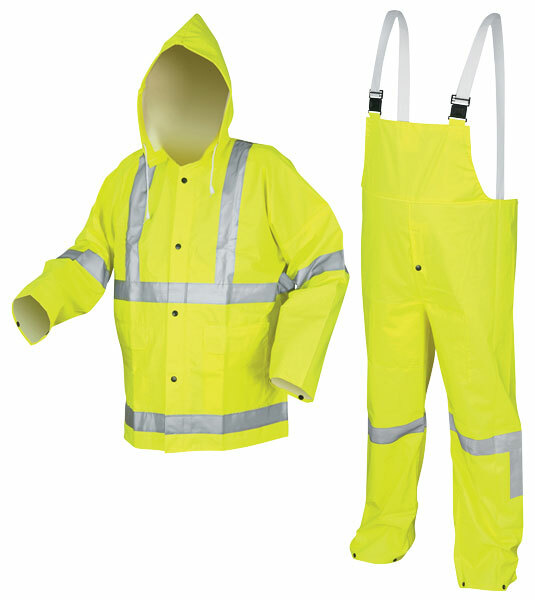 This suit meets ANSI/ISEA 107-2015 Class 3 High-Visibility Standards.